January 27, 2017 – The U.S. Air Force today awarded Boeing $2.1 billion for 15 KC-46A tanker aircraft, spare engines and wing air refueling pod kits. 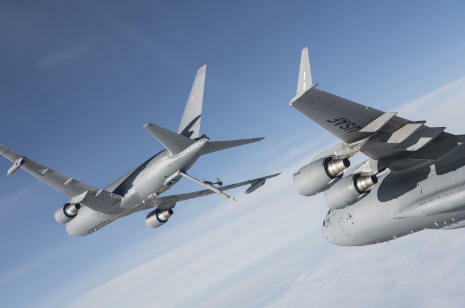 “This award is great news for the joint Boeing-Air Force team and reinforces the need for this highly efficient and capable tanker aircraft,” said Mike Gibbons, Boeing KC-46A tanker vice president and program manager. The KC-46A is a multirole tanker that can refuel all allied and coalition military aircraft compatible with international aerial refueling procedures and can carry passengers, cargo and patients. Boeing is assembling KC-46 aircraft at its Everett, Wash., facility.